Ah, Prowein. The world’s leading trade fair for wines and spirits. This event provides three days of intense, concentrated business and networking opportunities...And we do mean intense. If you can make it there, you’ll make it anywhere. Enter New York wines. 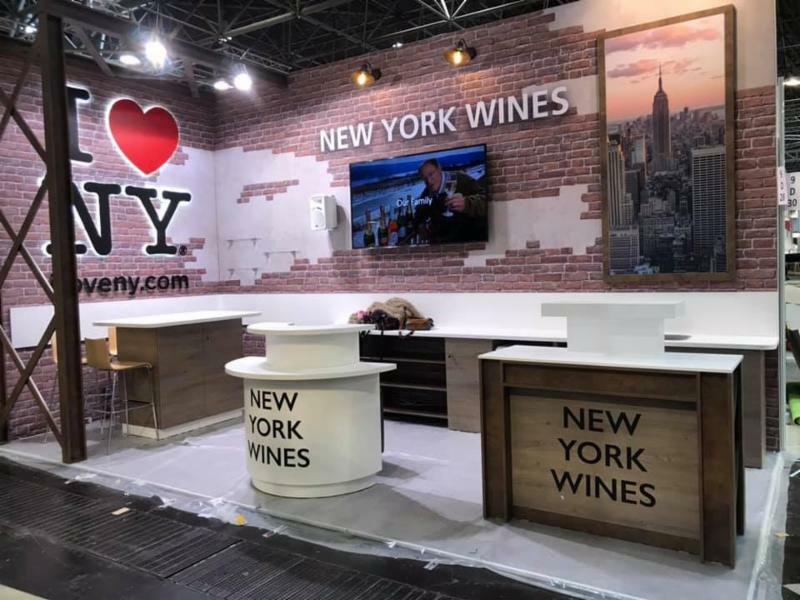 Thanks to the Export Program the New York Wine & Grape Foundation has the privilege of representing New York wines at major international trade shows. The goals of this activity are twofold: first, we aim to help our participating wineries sell their wine in the international market. There is simply no better opportunity to connect to interested importers, distributors, and on-trade partners in Western Europe than Prowein. Our second goal is to raise the profile of New York wines on the world stage. Over 60,000 members of the international trade and media attend Prowein. To make sure we made a memorable impression, this year New York’s trade show presence was redesigned to include recognizable elements of our worldwide brand. Working with partners at Empire State Development, we were able to use the iconic “I Love NY” logo as the anchor to our brick wall background and New York City skyline. This year we also tested our small space to incorporate room for educational seminars. Welcome to New York. The Prowein booth just being finished. 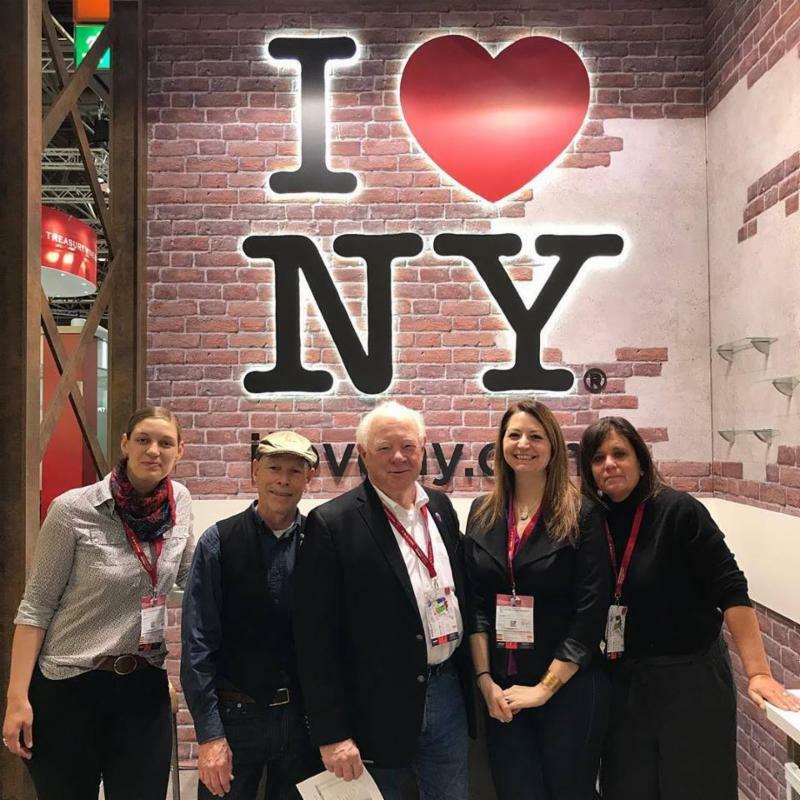 The Prowein Team representing New York (l-r): Julia Hoyle of Hosmer Winery, Bob Madill of Glenora Wine Cellars, John Martini of Anthony Road Wine Company, Jennifer Menges of Hermann J. Wiemer Vineyard, and Mindy Crawford of Wölffer Estate Vineyard. Though it was our first ‘test drive’ and we have lots of room for improvement, it feels like we nailed the goal of making an impression. The first inclination that we had a winner was a text from David Orr, our stand designer at Poretta & Orr, saying “It’s going up, this looks good. People are stopping to take pictures.” Excitement mounted as our team received text updates as the brick wall, logo, girders and screen went up. The added attention and attendees coming to take selfies in our booth, resulted in interviews for Mindy Crawford of Wölffer Estate Vineyard on the importance of Prowein to U.S. wineries, Bob Madill, representing Glenora Wine Cellars about Gamay as a varietal trend, and Julia Hoyle of Hosmer Winery and I interviewed on the history and current state of the wine industry in New York. So, well deserved attention was paid to New York wines in Germany. While I still have stacks and stacks of business cards to sort through as contacts for our winery participants, we already know we had immediate impact on the recognition of New York wines. 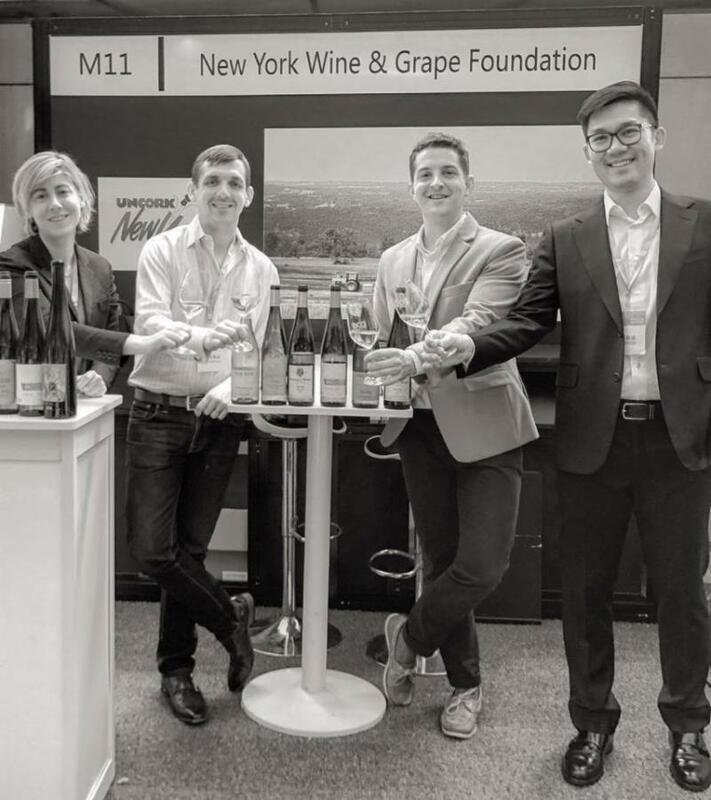 Oh, and while Prowein was going down, our small but mighty team in China was representing New York on another continent at the Chengdu Food & Drinks Fair. Our friends Lauren Maltese of Boundary Breaks, Kelby Russell of Red Newt Cellars, andMathew McFetridge and Kelvin Fu of FLX Internationalrepresented New York wines at this biannual event. CFDF is the largest and oldest exhibition fair in China and has been considered as the most important branding and communication platform for the wine industry there. 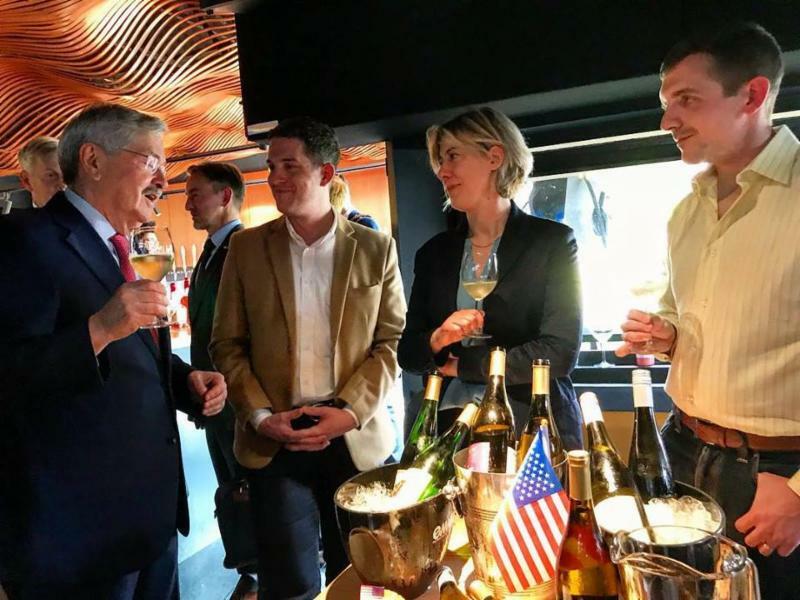 The New York Wines Team speaking with the US Ambassador to China, Terry Branstad former Governor of Iowa, about Finger Lakes wines and the potential for the export market. Next up in May is Vinexpo Bordeaux and our “New Faces New York” Tasting & Wine Seminar in London. In June we’ll see our friend Christopher Bates, MS, traveling to represent New York Wines at a seminar and wine dinner at James Suckling’s Wine Central wine bar and restaurant in Hong Kong. Believe me, the excitement never ends in the Export Program, and if it is right for your winery and your business model, we invite you to be a part of the action. The Export Program runs from July 1st – June 30th. We will be sending out an updated call for participants by May 1st. If you would like to learn more about the program right now you can listen to an overview or updates on upcoming marketing activities in Canada and the U.K. If you are interested in being a part of our Export Program Advisory Committee, please email me by April 5th. We’ll be convening a call mid-month to discuss activities and markets for 2019-2020. Hopefully, by the time you are reading this, the New York Wine & Grape Foundation team will be resting up after a successfulNY Drinks NY Grand Tasting last night in the Rainbow Room high atop the Rockefeller Center in NYC. From Düsseldorf to Chengdu to NYC, this has been an epic month for New York wines and our team. I can think of no better way than to cap it off than at the 'Top of the Rock' right here at home. We hope you’re enjoying this journey with us, and that you are are as excited about the things to come as we are. It's wild to think that we're still just getting started.